Australian actress Ruby Rose has alarmed fans after sharing a picture of herself in a wheelchair on Twitter and Instagram. So..For the past few years (decade) I’ve been dealing with a spine issue. I am now recovering from a back procedure, but I do need to stay active, so before I get seen with my cane and wheel chair in public, I’d rather put it out there that I’m fine and going to be fine. Despite her reassurances she’s fine, back surgery doesn’t sound like a picnic. Neither does suffering with pain for a decade, so I guess it’s the lesser of two evils. Behind every strong female lead is another strong female lead. Definitely Breath of the Wild Ruby. 2017 game of the year without fail. Can’t think of a better way to start 2018 than chilling out and revisiting that incredible game? Found this OLD GEM today!! Flash back to my first day stunt training for John Wick!! On the plus side guess who had to quit smoking !!!!! YAY!!!! Im done ! I’m finally done.. that filthy, smelly, dirty, slowly killing you while you pay for it to suffocate you, is finally out of my life. I quit yesterday. And for my back ( and Mum ) I’ll never start again. ??? Back surgery seems like a pretty extreme way to quit smoking, but as someone who’s successfully quit smoking every single January, I’ll be checking in with Ruby to see if it works. This isn’t the first time in recent months Ruby’s been the centre of attention for concerned fans – she recently had to hit back at fans who were worried about her ‘dramatic weight loss’. A dietitian advised an Australian magazine how Ruby’s family and management team should encourage her to increase her (estimated) weight of 44kg which – at a tall 5’7″ – should apparently be around 61kg. 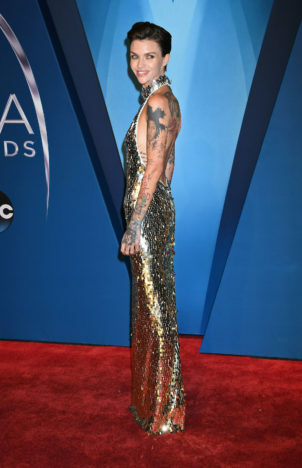 Fans have also expressed concern after images emerged of Ruby looking very thin in a sparkling silver dress as she attended the Country Music Awards, in Nashville, Tennessee. However, the striking Orange Is The New Black actress has not taken kindly to this very personal public scrutiny, advising her critics to ‘stop judging others’. Her family and management team need to encourage her to gain some weight before it’s too late. Ruby has described De Fazio’s comments as being ‘so maddening and irresponsible’. Telling a magazine MY “manager friends and family should get involved and help me before it’s too late” and that my weight is “44 kilos” ( I’d probably be in hospital of that were true ) is so maddening and irresponsible. Body shamers, I had a great work out this morn[ing], thanks for asking, and am off to eat a vegan burger because why the F not! Body shaming SH*TS ME! It’s so frustrating. Everyone is so different. I eat so much amazing food. I just don’t drink alcohol or eat processed food, or meat or dairy and I train every day. I’m plant based and stupidly healthy. I trained my a*s off for three action films, I used to be a boxer. My body is just my body. It fluctuates and it changes depending on how hard I train. The end. Confident Ruby previously addressed commenters directly when they remarked upon her slim physique and has explained how her appearance is due to being a dedicated vegan who keeps alcohol at bay. How could I inspire people to overcome something I know nothing about? I can inspire them to go plant based and stop eating the nasty processed food, fast food and cancer causing foods. I can inspire them not to drink soda or alcohol and how to train well… but maybe you can train yourself to stop seeing what you think is the only way to achieve someone else’s body type? When you say I looked the best in the MTV days in my early 20s…You guys.. that was a horrible time in my life health wise. I drank everyday, ate junk food all day and McDonald’s at 4 am when I was stumbling home from work. I know I wasn’t healthy despite being bigger than I am now, because I got sick every month with pneumonia and chest infections. I get sick maybe once a year now. So please take care of your body and your mind and your soul and stop judging others. Many fans have rushed to Ruby’s defence, believing the obsession over her figure – which she admits changes depending on her training routine – is unfair. Of course, Ruby has a huge fan base who care about her and want to make sure she’s doing okay. However, it’s never cool to make speculative comments on another person’s body, no matter what size or shape they are.